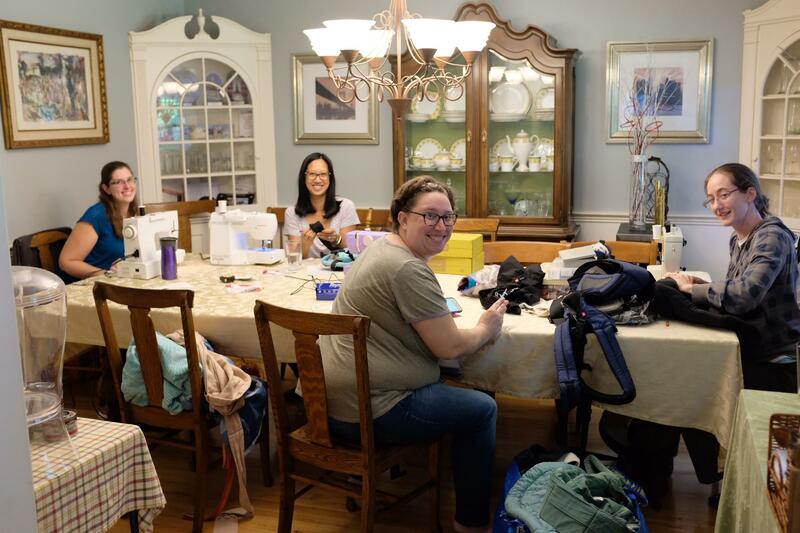 Babywearing Connecticut maintains a library of carriers that are available at meetings for anyone to try out. It’s a great way to try a new style or brand of carrier. Members are allowed to check out carriers to use for a month at a time. You can view our library policies here. Our library grows fastest through member support so we encourage individuals to consider membership as an option. Plus membership means having a different carrier every month for a year for only $30 – not a bad deal! If you’d like to see a particular carrier in our library, let us know and we will work on it. We are always open to ideas and suggestions. Image of our volunteers removing and replacing the library tags from all our lending library carriers! From left, Lore at a sewing machine, Jojo at a sewing machine, Emily ripping those tags off, Christa at a sewing machine!